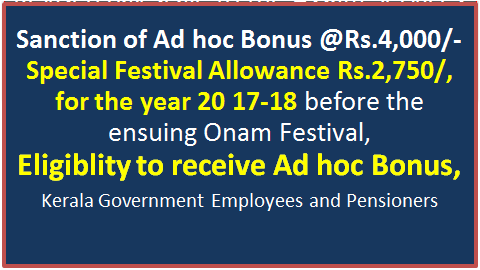 (i) For those drawing emoluments of more than 4,000/- per month and not exceeding Rs.25,000/- (pre-revised scale), Rs.26,000/- (revised scale) per month, the Ad hoc Bonus will be calculated as if the emoluments were Rs. 4,000/- per month. In the case of those who have opted to come over to the revised scales of pay on or before 31.03.2018, the term “emoluments” means Basic pay, Personal Pay, Special Pay, Special Allowance, Personal Allowance and Dearness Allowance at 15% of the basic pay in the revised scale, excluding House Rent Allowance and other Compensatory Allowances.